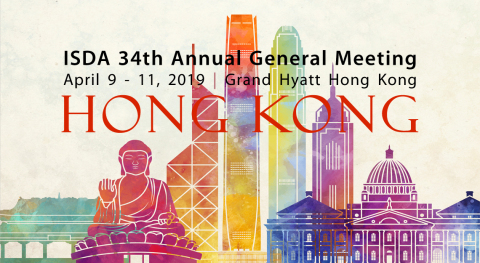 --(BUSINESS WIRE)--Join the International Swaps and Derivatives Association, Inc. (ISDA) at its 34th Annual General Meeting (AGM) in Hong Kong from Tuesday April 9 until Thursday April 11. Accredited journalists are invited to attend the event and must register in advance. The ISDA AGM is the premier event for derivatives professionals globally. Bringing together hundreds of senior industry executives and policy-makers over three days, the event combines top-quality content with unrivalled networking opportunities. Watch video highlights from last year’s AGM in Miami! Additional information regarding the conference, including an agenda, is available on the ISDA's website. An updated agenda will be available in due course. Press are invited to attend all social events, including the pre-conference welcome reception on Tuesday April 9 at 7:30PM. Please note that attendance at the evening events is granted on a strictly off-the-record basis and is for networking purposes only, not for reporting. Conference sessions are held on Wednesday April 10 – Thursday April 11, 2019. The pre-conference members’ welcome reception is on Tuesday April 9 at 7:30PM. Since 1985, ISDA has worked to make the global derivatives markets safer and more efficient. Today, ISDA has over 900 member institutions from 69 countries. These members comprise a broad range of derivatives market participants, including corporations, investment managers, government and supranational entities, insurance companies, energy and commodities firms, and international and regional banks. In addition to market participants, members also include key components of the derivatives market infrastructure, such as exchanges, intermediaries, clearing houses and repositories, as well as law firms, accounting firms and other service providers. Information about ISDA and its activities is available on the Association’s website: www.isda.org. Follow us on Twitter @ISDA.